For the third straight year consumers will have the option of buying a combo pack featuring MLB and NBA games. 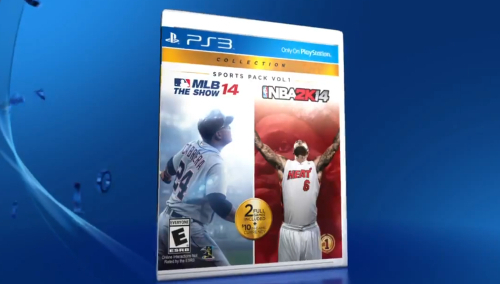 Sony announced today that PS3 versions of MLB 14: The Show and NBA 2K14 are being bundled for $90 to release on April 1. Last year 2K Sports offered a MLB 2K13/NBA 2K13 bundle for $80. The year prior it was MLB 2K12/NBA 2K12 for $70. The cheaper prices with those deals were meant to entice consumers who had an interest in NBA 2K to buy the far less desirable MLB 2K along with it. The combos represented good value by artificially reducing the price of MLB 2K without simply dropping the price which was prohibited in the licensing deal. The value of this latest combo is not as a strong but features a far better baseball game. NBA 2K14 on PS3 can be bought new for $40 or for cheaper if buying a used copy meaning at most the deal saves $10 and that probably isn’t enough to get someone who has passed on 2K14 for six months to jump on this pairing. In order to add another selling point $10 worth of in-game currency is being included with $5 of The Show’s “Stubs” and $5 of 2K14’s “Virtual Currency”. There has still been no comment from SCEA regarding a PS3 and Vita combo deal (available for MLB 12 and MLB 13 for $80) or a “trade-up” promotion for those interested in buying the PS3 version before moving on to the PS4.